Offering medical care when you need it the most. We’re Here to Take Great Care of You? Whether you’re searching for a primary care doctor in Falls Church or you’re just curious where the nearest urgent care facility is, you can count on Medics USA to take great care of you. From annual checkups to physical exams to urgent care services, our team of experts offers exceptional service. Scroll down to see a complete list of all of the services you can expect from our Falls Church office. 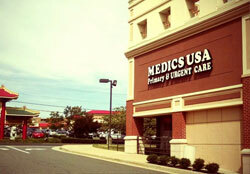 The Medics USA office in Falls Church offers both primary care and urgent care. We are accepting new patients, including children. We accept almost all insurance plans, Medicare, and Medicaid, and also provide discounted service for people with no insurance. Mina Salehi, MD, is a Board-certified Internal Medicine specialist with broad experience in both urgent care and primary care in the Northern Virginia area. 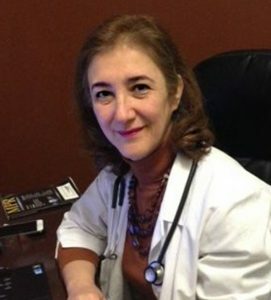 After attending medical school and serving as a hospital physician in Iran, she came to the United States and completed her residency in internal medicine at Howard University Hospital in DC. She is fluent in Farsi. Community Care Program – No Health Insurance? No Problem! A Medics USA program for people who don’t have medical insurance: Sign up and receive deep discounts on basic items like office visits, exams, and tests. We offer same day appointments at our Falls Church office – call today or book your appointment online! We are in the Seven Corner shopping center (near Gold’s Gym), across the street from the Eden Center.